The UN Special Envoy for Haiti has released updated numbers on international aid pledges from last March’s donor conference, showing just a minor increase since the last update in early April. 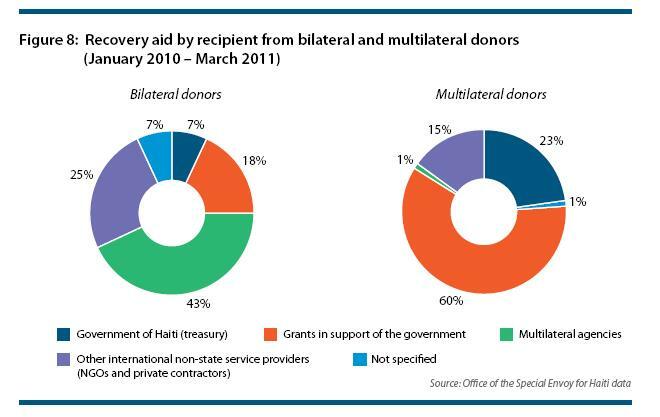 Although many donors claimed they were waiting for the new government to take power before releasing aid disbursements, the recent analysis shows that so far at least, little new aid money has been forthcoming from Haiti’s largest donors. In a statement released today, the Special Envoy reported that 37.8 percent ($1.74 billion) of the $4.6 billion in aid pledges had been disbursed through June, up from just 37.2 percent ($1.71 billion) through March. The United States has disbursed just $120 million of the over $900 million appropriated for Haiti, a disbursement rate of just 13.7 percent. This is lower than what had previously been reported. After the earthquake, the international community pledged significant financial resources for both the relief and recovery efforts. Yet many of us have been frustrated with the transition between the two phases. Over the past year, donors have disbursed over $1.74 billion for recovery activities, but over half—$2.84 billion—of what was pledged for 2010 and 2011 remains in donors’ hands. And yet disbursing funds is only part of the aid picture. We know from our shared experiences in Haiti and elsewhere that the way aid is channelled matters a great deal, and determines its impact on the lives of the Haitian people. For example, with over 99 percent of relief funding circumventing Haitian public institutions, the already challenging task of moving from relief to recovery—which requires government leadership, above all—becomes almost impossible. Accompaniment complements aid effectiveness and human rights principles in a number of ways. It stresses the importance of the Haitian government and its citizens being “in the driver’s seat.” It also calls for aid to focus on the creation of a robust public sector and a healthy private sector that provide meaningful opportunities for citizens. In addition, with its strong emphasis on implementation, accompaniment is specifically focused on guiding international partners to transfer more resources and assets directly to Haitian public and private institutions as part of their support. The UN appeals did not include the funding needs of the government and provided limited opportunities for Haitian organizations to seek funding. The initial appeal document included the funding needs of UN agencies and international NGOs only; no Haitian NGOs were included in the first version of the appeal. Later 10 Haitian organizations were added to the appeal, but just two received funding, and in very limited amounts. Haitian organizations received just $0.8 million of a requested $5.4 million, which made up only 0.4 percent of the entire UN appeal. Aid pledges for recovery, however, did provide the Haitian government with some direct budget support, which in 2010 totaled $204.1 million in direct support and another $60 million in support through the Haiti Reconstruction Fund. The total breakdown of recovery aid can be seen in Figure 8 (taken directly from the Special Envoy’s report). Over 50 percent of the budget support disbursed after the earthquake arrived in the last two months (August and September 2010) of the Haitian fiscal year, more than eight months after the earthquake. According to the IMF, only 29 percent of the budget support pledged for the 2011 fiscal year has been disbursed by donors, although over half of these funds remain in the HRF and have not yet reached the government. The delayed disbursements to budget support negatively impacted the government’s ability to effectively plan activities. To read the full report from the UN Special Envoy to Haiti, click here (PDF). 1. The UN Special Envoy, while distinguishing between relief and recovery aid, notes that "While in practice it may be difficult to distinguish between activities in Haiti that exclusively support either the relief or recovery efforts, there are different funding pools and associated regulations that determine how donors provide aid to each. In addition, donors also adopt different approaches to meet immediate needs—such as food, shelter, water and sanitation—than for recovery and long-term development. This report distinguishes between relief and recovery activities based on the funding pools that were used to support them."